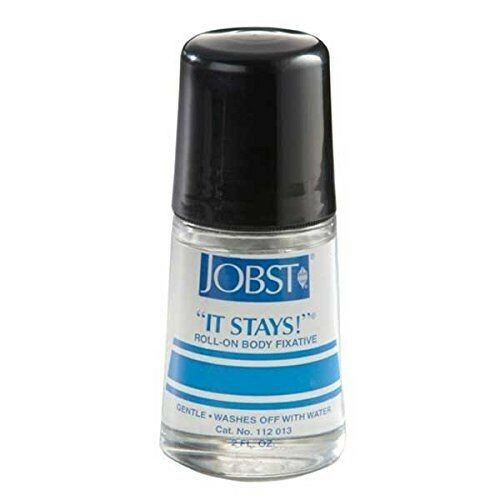 It Stays Body Adhesive 2oz is an adhesive that is designed to work in conjunction with Mens and Womens compression stockings. Jobst Stay Body Adhesive is a Support Sock and Stocking Accessory that will hold medical garments, support stockings, and appliances to the skin without the risk of irritation. It Stays Compression Stocking Adhesive comes with a roll-on applicator, for a smooth application every time. Jobst Adhesive Stays are gentle enough that it does not irritate the skin and water soluble for easy clean-up. Removing this Jobst Compression Stocking Adhesive is easy. Just wipe the affected area clean with a damp rag. It Stays adhesives are made in the USA. Jobst product number: 112013. Is there silicone in this product? Latex? Thank you. This product contains neither latex nor silicone.